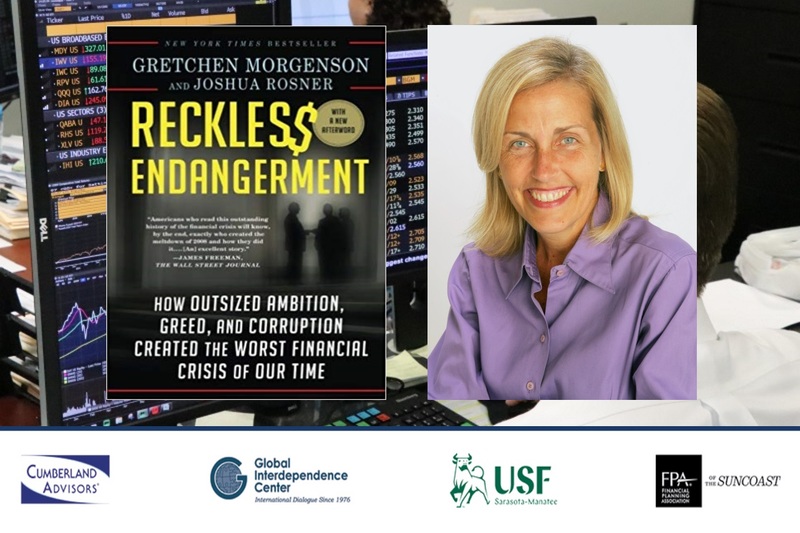 Gretchen Morgenson delivered the keynote address, titled “Why Financial Literacy Depends on Press Freedom,” at Financial Markets and the Economy – Financial Literacy Day III, the annual major conference that Cumberland sponsors at the University of South Florida Sarasota-Manatee (USFSM). Morgenson is Senior Special Writer in the Investigations Unit at the Wall Street Journal. She is a Pulitzer Prize-winning journalist notable as the longtime writer of the Fair Game column for the New York Times. In November 2017 she moved from the Times to the Journal. Following the conference, she signed copies of her book Reckless Endangerment: How Outsized Ambition, Greed, and Corruption Led to Economic Armageddon at an event that benefited the Committee to Protect Journalists, an independent, nonprofit organization that promotes press freedom worldwide. The CPJ “defend[s] the right of journalists to report the news without fear of reprisal. around the world.” Learn more about the CPJ here: https://cpj.org/about/. Here is a YouTube of Morgenson’s keynote: https://www.youtube.com/watch?v=SoFDUbQdsBo. She then engaged with the audience in a Q&A session. Here is a YouTube: https://www.youtube.com/watch?v=bGNxZcSV3Ss. Financial Literacy Day III was open to the public, and the auditorium was packed. Registration cost was just 50 bucks, which included lunch. Our partners for the event were USFSM, the Global Interdependence Center (GIC), and the Financial Planning Association of Florida (FPA). We are proud supporters of all three partner organizations and were pleased to bring this high quality dialogue to the greater Florida Westcoast region and to the rest of the world via the event livestream. From our email flow we see that viewers responded from five of the seven continents – we are not sure about the Antipodean realm or Antarctica. Part one of our Defending First Amendment Freedoms is here: https://www.cumber.com/cumberland-advisors-market-commentary-defending-first-amendment-freedoms/. Part two is here: https://www.cumber.com/cumberland-advisors-market-commentary-defending-first-amendment-freedoms-part-2/. For future GIC program plans see https://www.interdependence.org/events/. We hope you found the conference and the First Amendment series worthwhile. Interesting week in the equity market. A couple of things jump out at us. Continued strength in the equal weighted indexes vs. cap weighted. We like to see that. That’s showing capital spreading out in the market. What else we noticed and like to see is some underperforming sectors like energy and financials getting a little bid in here. There are multiple ways to trade a tough position. Financials! The “dogs” of the last 24-36 months. We look at them. And how things relate to pricing power. On April 11, 2019, Cumberland Advisors’ held the event, Financial Literacy Day III: An Update on Financial Markets and the Economy. We really enjoyed this opportunity to connect with our friends, clients, and the community that live and work near us in Florida. If you couldn’t attend or you did attend and want to re-experience this information packed day, we’re posting talks and panels from the event on our YouTube channel. Included in this email is Gretchen Morgenson’s keynote address and Q&A session from the conference. We’ll be posting more videos over the next week or so. Enjoy!